For all the planning and good intentions the last week has been wiped out in a fog of sniffles, splutters and full body aches. And to add insult to injury the glorious weather we’ve been basking in for weeks caved in to bring the traditional chilly windy Wellington weather. It’s a frustrating state of affairs but what can you do? Although outdoor chores were off the agenda I’ve been hard at work in the kitchen with cooking, baking and preserving and getting throughly engrossed in my pile of birthday books. I was lucky enough to receive some lovely books which fit perfectly in my kitchen library. The Art of French Baking is going to give me a new and exciting baking adventure to master french style pastries and sweet treats. After allowing my paella pan to gather dust for so many years it was a recipe by Ottolenghi that reminded me how delicious paellas are and a lot of fun to make. With a whole book about Paella I can now experiment a lot more. Having read an extract from Alice Waters the Art of Simple Food in the Penguin Good Food Collection I can now enjoy the full version and I’ll have my work cut out to make the most of it before I try and book a table at her restaurant Chez Panisse during out stop over in San Fransisco en route to UK in a few months. Last but not least I’m enjoying the latest of the River Cottage Handbooks which I always find really practical reference books. With this one I shall be stretching my growing muscle in the herb bed next season. 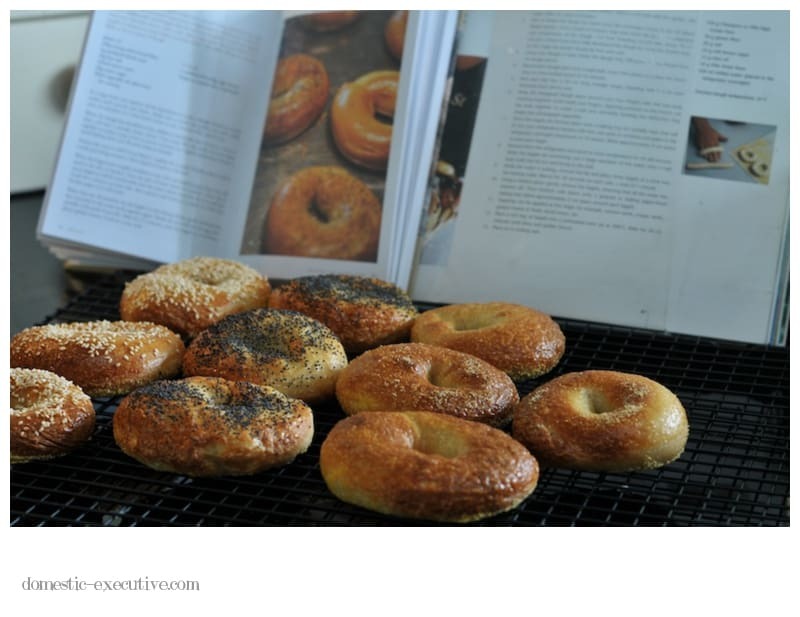 Earlier the year as part of my bread making challenge I baked bagels. Or rather boiled and then baked the bagels. They were ridiculously easy to make although I think practice makes perfect when it comes to rolling and shaping them. Home made bagels taste nothing like the almost rock hard kind you get from the supermarket. These are much lighter and tastier. I first got hooked on bagels when I was a student and did a stint as a camp counsellor in the US. Staying in New York at the end of the trip I was able to sample bagels, cream cheese and lox (smoked salmon) from a shop in Brooklyn that only sold bagels. I still remember slathering the cream cheese on and biting into it. Although my own variety didn’t quite match up to the memory of that experience they were still pretty darn good. There is something about bagels that are just so good for the soul. In my research on bagel recipes I found out at that a cafe in Wellington claims to be the first kiwi to bring authentic bagels to New Zealand. It’s a cafe I’ve not been to in a while so I have made a mental note to go there soon and try out their bagels. 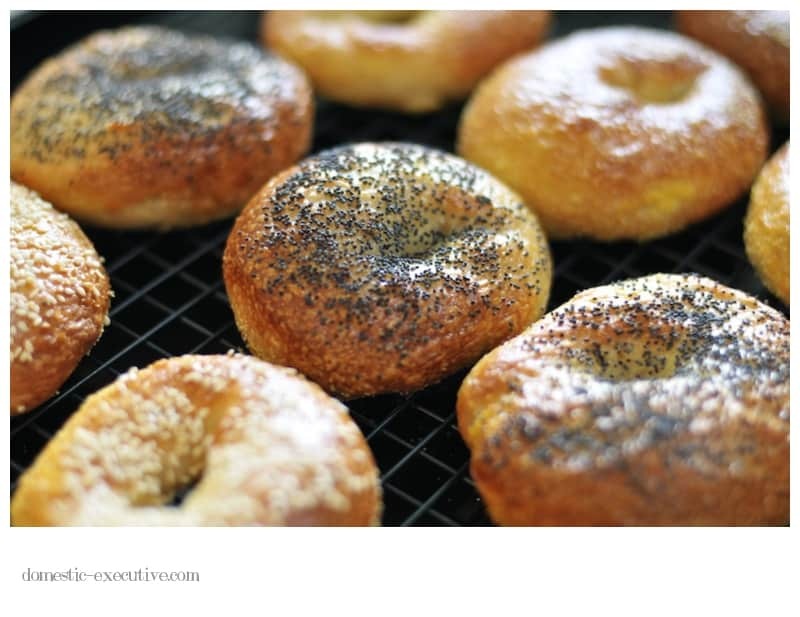 If you want to give bagel baking a go. I used the River Cottage Bagel recipe as a basis and it was quick easy and bagels so tasty I’ll be using that recipe again next time. They look amazing! I am not a bagel person but every now and then I buy them at the Oratia farmers market (they are nice there) but I never thought of making them. Mmmhh!!! BTW, would you like to host a Sweet New Zealand? You haven’t had a turn yet, and June is up for grab! Beautiful, I have only made them once and although they are easy to make mine turned into huge bagel monsters! Must have another go soon. Definitely give them a go Alli, they are nothing like the ones you buy from the supermarket. 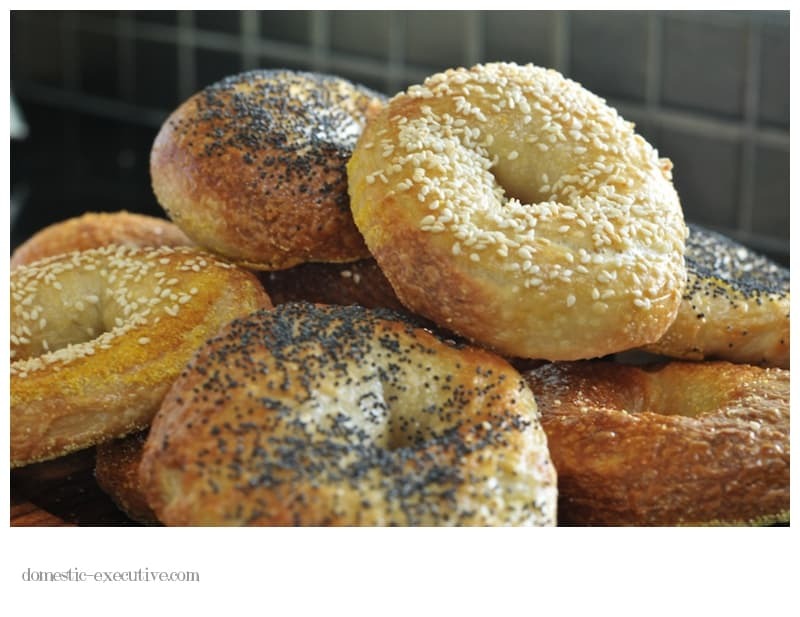 Ok, I totally have to try this – your bagels look divine, and I had no idea that they were actually easy to make – I always thought they would be incredibly hard and complicated to make. Especially as I haven’t come across any good bagels here in Nelson yet, I definitely need to try. Actually one of the things I miss most about Christchurch is Vic’s Cafe chocolate chip bagels. They look amazing Julie, I do like a little bagel with cream cheese and salmon, with just a little lemon zest and capers. One of my favourite breakfasts, I really must give these a go one weekend. When are you off to the mother country?? ?